We lost dear Irene, my mother-in-law, a few short weeks ago. She is often in my thoughts and I want to take some time to talk about her and, yes, cook something in her honor. Irene lived a life of service to her family and her community. When my husband was a little boy, he and his parents moved to northern Wisconsin. His father was the only physician in their small town. Irene trained herself to serve as her husband’s x-ray technician and took on many other duties in their cottage hospital. She was involved in her church, especially the youth program, and taught her only child how to fly fish, sew, clean house and to play tennis, volleyball and baseball. Cooking was a chore rather than anything else for my mother-in-law. Irene once described herself as an “uninspired” cook. She enjoyed her meals in our home, but rarely commented about anything I served, except to always thank me after our meal together. Her appetite was diminished and she always asked for a small portion. 1. Using a large, heavy-bottomed pot, such as a Dutch oven, melt the butter over low heat. 2. Add the celery, carrots and onion. Cover vegetables with a buttered round of parchment paper, buttered side down. 3. Cover pot and simmer vegetables for 15 minutes. 4. Using kitchen twine, tie together the parsley and bay leaf to make a “bouquet garni”. 5. Discard the paper from the vegetables. Add the bouquet garni and the stock. Bring to a boil. 6. Reduce heat and simmer, covered, for 20 minutes. 7. Remove and discard the bouquet garni. 8. Coarsely chop the chestnuts and add to the soup. Add the Madiera and simmer for 10 minutes. 9. Using a blender, puree the soup in small batches. Use a large bowl to hold the pureed batches. Return pureed soup to the pot. Add the cream. Add salt and pepper to taste. I think I can see why she loved this recipe – so rich and luxurious! Lovely post, Liz. 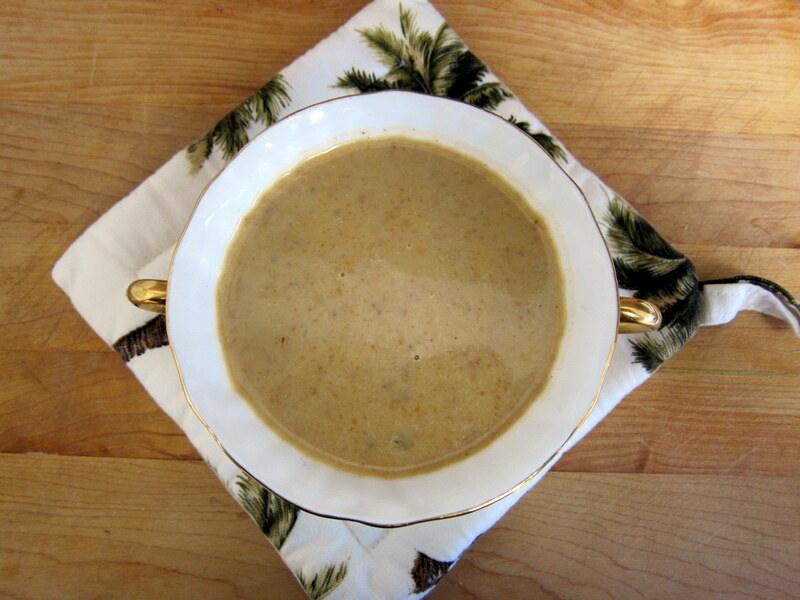 A bit out of season, but still the perfect starter for a winter dinner party – thanks, Lynda! Liz, what a lovely culinary tribute to your mother-in-law. Thank you for sharing it, and the recipe. Thanks, with my husband’s heart attack, we are only now fully absorbing th e effects on the family of her death. Hi! Just wandered over from Sodium Girl’s site. I loved your comment about the Ugg slippers – my daughter did the same thing last week. Too funny! This soup sounds AMAZING! I’ve never used jarred chestnuts, or any chestnuts, for that matter. I wonder how high in sodium they are (or aren’t)? Will have to investigate b/c this soup sounds dreamy. Thanks for sharing!